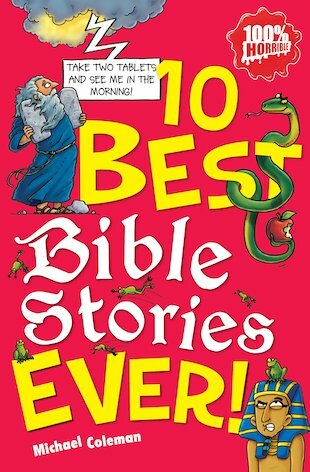 10 Best Ever: 10 Best Bible Stories Ever! Ten bloodthirsty tales of biblical gore retold in Horrible style full of jokes and cartoons. Yup: it’s the Bible that no one wants you to know about. The HORRIBLE Bible. Full of dreadful deeds to make your stomach lurch. Killer whales. Dire floods. Angry giants. Fierce battles. Bloody murder. Plus comic strips, crazy facts, jokes and even the odd ancient celebrity or two. After all, why bother with the boring Bible when you can read the Best Ever Bible? A funny new twist on the bestselling book of all time! It is really good. But it is quite un appropriate. It is the best book I have read in year 6 so far. Im up to the end part forgot the last chapter though. I want to read the other books of this amazing author. I suggest u read it . I love it!!!! It was very funny and informative. It made me view the classic Bible characters such as Moses and Noah in a totally new way. This book is a fun way to learn about some of the main stories in the bible. It is great and i love it. It is very good you must put this on you “must buy” list!